So, technically it's fall. Are we seeing any leaves turning their tell-tale autumn hues and drifting to the ground? Not exactly. However, that does not stop me from going into full cuddle-up-and-snack mode at the drop of a hat. Go outside? Not it's too cold, I must cuddle and eatallthesnax! 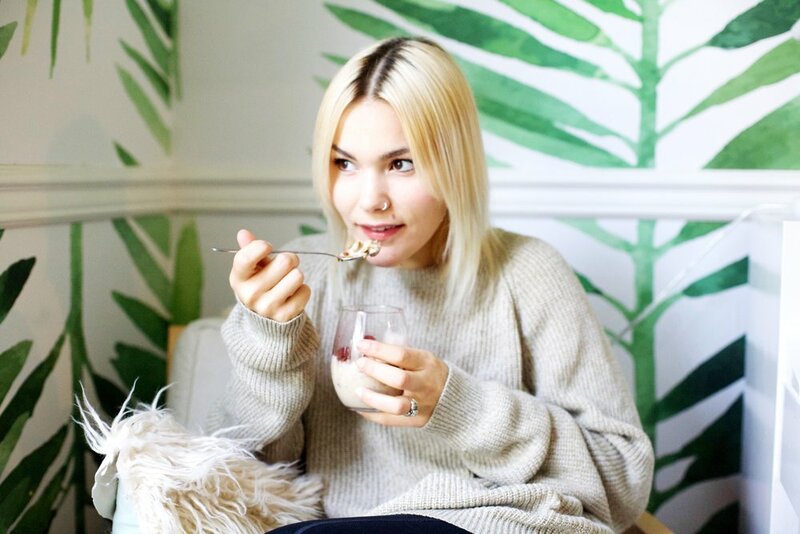 I've always joked that granola is my spirit food; throw a handful of it on a smoothie bowl, and you've got a divine treat! I've been known to eat handfuls at a time, opting for the fresher, naturally sweetened, small batch brands, or making my own. I'm so pleased to share with you my favorite granola recipe of all time. That's right! I've teamed up with Graze to bring you the most delicious post-workout (or post-long-day-at-the-office) snack to refuel and replenish your body. This granola is super special, and I decided it would be the perfect topping for a coordinating smoothie bowl with complimentary ingredients. There is, however, one star ingredient in both recipes. B A O B A B P O W D E R - Baobab is a 100% natural and organic African superfruit. It is the only fruit in the world that dries on the branch, producing a natural superfood powder that is exceptionally nutrient-dense and supports a wide range of health and beauty benefits. + Vitamin C - Just 2-3 tsp of the stuff provides you with 33% of your DV of Vitamin C! What?! + Fiber -Baobab is practically 50% fiber, which helps slow down the release of sugars into the bloodstream, and aiding in healthy digestion. + Antioxidants - According to the Journal of Nutrition, Baobab has the highest antioxidant value of any fruit....okay, I'm sold! 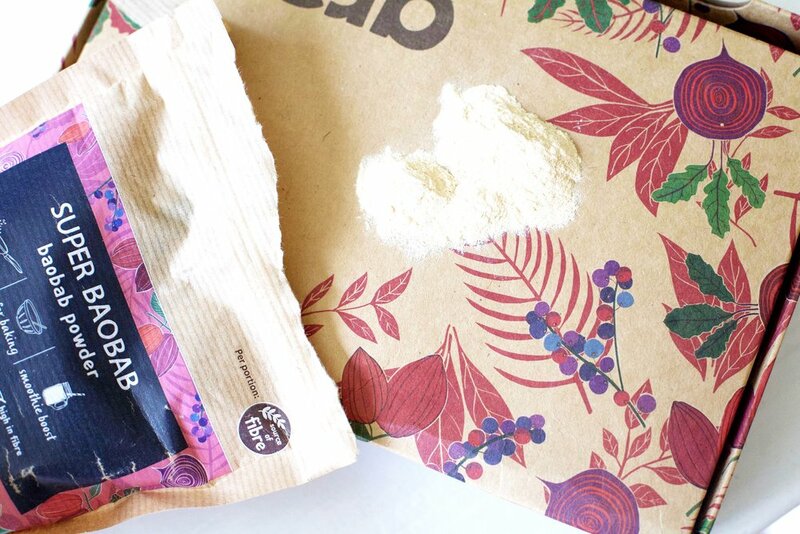 Wanna grab your own baobab powder to get started? Snag it here. Ready to dive in and make the smoothie bowl? Let's go! In a large bowl, combine melted coconut oil, tahini, sweetener of choice and pumpkin puree. Begin to add your oats, coconut, chia seeds, baobab powder, cinnamon, and salt. Fold in the dates and almonds until everything is sticky and somewhat coated in the pumpkin mixture. Bake for approximately 25 minutes, checking periodically. Granola burns really quickly so be careful!!! Allow to COMPLETELY COOL. Like, don't even mess with it. It should be one big brick, so now break it up into chunks! I like chunky granola but if clusters aren't your thing, you can crack it into little bits. Combine all ingredients in a high-speed blender until creamy. Pour in a shallow bowl and smooth the top. Stick in the freezer to set while you prepare the toppings. Top with granola, fruit, and honey! *This is a sponsored post with a brand I'm passionate about! I like to bring you guys the best finds out there!